You are probably familiar with the Orion constellation, the first one you learnt as a child easily identifying Orion’s belt with those 3 stars lined up in a row. Below Orion’s belt lies his sword and one of those points of light in the sword is Messier 42 (M42) The Great Orion Nebula. 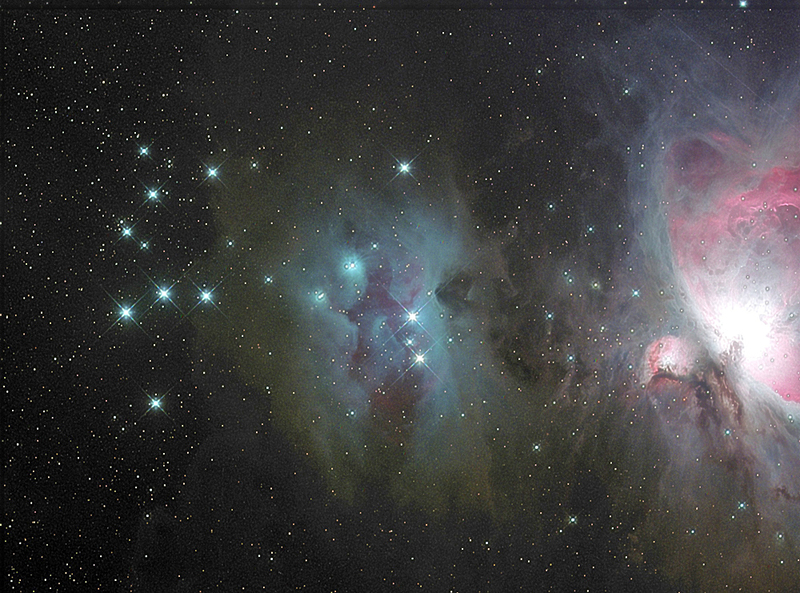 NGC 1977, often called The Running Man Nebula (centermost in this picture) is a blue reflection nebula (it’s illuminated by the light from nearby stars) located in Orion 0.5 degrees northeast of the main M42 Orion nebula. Its approximately 1500 light years away and 24 light years across. This nebula is easily identified with the naked eye being the most visible in the northern hemisphere and a target for most people’s first attempts at deep sky objects. With the naked eye and under good conditions, the nebula can appear as a fuzzy patch. Exposures of 30 seconds with a DSLR should show a purple smudge. Through my telescope its a green/grey wispy cloud that does quite well in filling the field of view, especially with a Barlow attached. Also on show in the nebula are 4 bright stars that make the Trapezium cluster. This nebula has always been a favourite view of mine, probably because its the first one I ever saw. People often seem surprised that you can’t see much colour through a telescope. Human eyes are not sensitive enough to see colour in dim objects. The only proper way to get colour is to take long exposures. Its times like this when you appreciate dark skies. When the sky glow i.e. from light pollution is the same magnitude or greater than the faint details of the object being observed, then there is no contrast and as such you wont be able to view. This is my first attempt using a dedicated Astro CCD and is made from 6 x Luminance 120 second exposures, 4 x 120 second exposures each of RGB. Calibrated and aligned in CCDStack, adjusted in Photoshop.